Matt Clarke Water Repairs - Plumber based in Eastchurch, Kent. I have worked on the water industry for around ten years now. 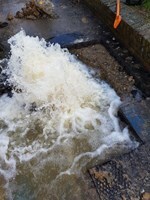 I have worked with Thames Water, South East Water and Affinity Water. We are polite and friendly and give accurate quotations. We take great satisfaction in all the work that we do. We are clean and tidy. We do a 24hr call out service covering South East, South London, East London, Essex and Stevenage. We will not leave no customers without water we can upgrade your supplies from old metal to poly pipe. We have a mole were we send under the ground where possible to save digging the whole route. There is no job that's to big or to small. We can re lay any supply or repair any leak that you have. We can change old inoperable stop taps for new ones. Call now for your free no obligation quote.